Ferguson (in the red trunks) bangs to the body in close. 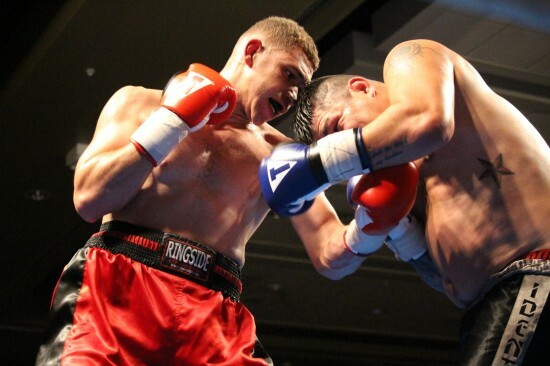 LEWISTON, ID — Pacific Northwest prospect Patrick Ferguson (5-0, 5 KOs) claimed an impressive fourth round TKO over journeyman Leo Bercier (8-20-1, 4 KOs) on Saturday night at the Clearwater River Casino in Lewiston, Idaho, adding his fifth win of the year inside the distance. In the main event of Beat Boxing Promotions’ inaugural card, Ferguson dropped Bercier early in the fourth before capitalizing with a vicious barrage along the ropes, forcing a stoppage. Ferguson, Spokane, Washington, employed a measured approach in the first round of the heavyweight bout, using his jab and movement to control the range and find openings for his right hand. Bercier, of Great Falls, Montana, made it a competitive round, pressing forward and landing with a few hard uppercuts in close, but Ferguson had the edge with the more telling blows. As the round wound down, Ferguson landed a jarring left hook, snapping back the head of Bercier. In the second, Ferguson began to close the gap more, meeting his opponent’s aggression and out-landing him in the pocket. A big right mid-way through the round stopped Bercier in his tracks and spurred on Ferguson, who unloaded with a volley of punches before moving out of close range, just as his opponent began to fire back. The fight became a battle of wills in the third, with Ferguson staying in the pocket and refusing to cede any ground to the Montana fighter, giving the crowd some exciting moments as the two traded. Ferguson, who through all this had been digging deep to the body, began to take over with the harder and more accurate shots in between Bercier’s flurries. Late in the round a left hook to the mid-section appeared to hurt Bercier. Ferguson unloaded, working the body with a slew of hooks before coming back upstairs. As the fourth got underway, Ferguson quickly closed in and went to work, unloading with an onslaught to the head and body. A thudding hook to the ribs dropped Bercier late in the round. Bercier made it up fairly quickly, but he looked very hurt as he grimaced and gasped for air. Ferguson pounced as soon as the ref allowed the action to resume, going back to working the body and visibly hurting Bercier with fierce left hooks and straight rights. Bercier, who has always had the reputation of being a tough fighter, fired back but in doing so left himself open for counters. Ferguson timed a wild Bercier left hook and found his mark with a debilitating right hand, buckling Bercier. Referee Joel Scobie made the wise choice to step in and call it, giving Ferguson the win at 2:20 of the fourth round. The victory marked the fifth professional win for the former USA amateur national heavyweight champion, who turned pro in April of this year. All of his wins have come by knockout. Six other pro bouts, two amateur match-ups and one exhibition match made up the undercard, all featuring Pacific Northwest fighters. Hempstead (in the white trunks) lands his right. Montana Heavyweight Eric Hempstead (5-0, 4 KOs) kept his unbeaten record intact, stopping Warren Brocky (0-2) in the second round of an entertaining slugfest. Both fighters engaged early on, opening up with hard shots in close, looking to quickly hurt their opponent. Hempstead, of Anaconda, was the first to do so, dropping Brocky with a well placed left hook in the midst of an exchange. Brocky was up fast and went after his foe as soon as the ref allowed it, but was quickly deposited on the canvass again, this time with a left hook followed by a right hand. In the second round, Hempstead began to work the body, digging with hard shots to the ribcage that appeared to slow Brocky, but the Fort Belknap, Montana fighter rallied back with his own attack, finding his mark with hard, looping punches. The two traded heavy leather in close for a moment with both landing their fair share, before Hempstead managed to take the lead with the harder shots. After a three punch combo appeared to hurt Brocky, Hempstead closed in and cornered him, ultimately dropping him with a right. During the count, referee Joel Scobie made the call to stop the fight, giving Hempstead the TKO win at 1:06 of the round. Local crowd favorite Austin Arnett (1-0, 1 KO) claimed a first round win over Cheney, Washington’s Daryl Gardner (2-9-1, 2 KOs) in a middleweight match-up. Gardner got off to an aggressive start, rushing Arnett with a wild attack. Arnett weathered the early storm, though, and settled into a measured pace, firing off precise one-twos to Gardner’s head as he came in. After a right hand wobbled Gardner, Arnett stepped in, throwing another right in close. Gardner fell, although it was hard to see whether it was the punch or a push that sent him down. Regardless, it was enough for Gardner to call it quits during the referee’s count, giving Arnett his first win as a pro at 1:26 of the round. Lewiston’s Andrew Whitfield (1-0, 1 KO) also claimed a quick win in front of his hometown fans, stopping late replacement CJ Mount (0-1), of Fort Belknap, Montana, in the first round. Whitfield caught Mount early, dropping him with a right hand counter as Mount stepped in. Whitfield pressed after the count and sent Mount down for a second time, again with a right. This time Mount looked wobbly as the referee counted. Whitfield wasted no time, rushing in and unloading as the fight was allowed to continue. Seeing their fighter taking punishment, Mount’s corner threw in the towel, prompting the stoppage at 1:37 of the first. The bout took place in the light heavyweight division. Hughey counters with an uppercut. 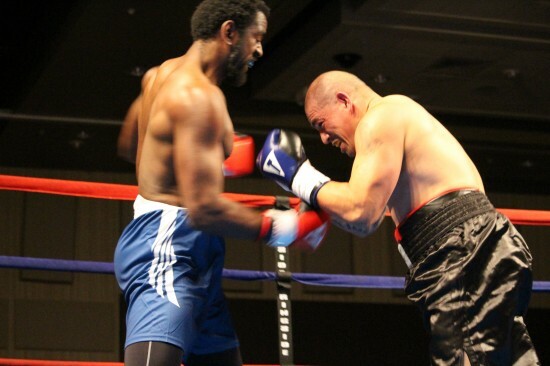 Former Washington State University basketball player Cedric Hughey (1-0, 1 KO), now living in Lewiston, scored a first round stoppage win over former Eastern Washington University football player John Villaro (0-1) in a heavyweight fight. Villaro came out blazing as the action got underway, smothering his taller opponent and firing off hard hooks in close. The show of superior strength didn’t last long and as soon as Hughey put some distance between himself and Villaro he unloaded with crisp one two’s, pushing back the shorter fighter from Spokane. Hughey showed some skill, working at range once he was able to stifle Villaro’s attack and countering well when Villaro made an attempt to get in close. Once a quick right to the chin hurt Villaro mid-way through the round, Hughey let his hands go teeing off for a sustained rally that forced referee Joel Scobie to step in wave off the fight at 1:56 of the round. Both fighters were making their pro debuts. 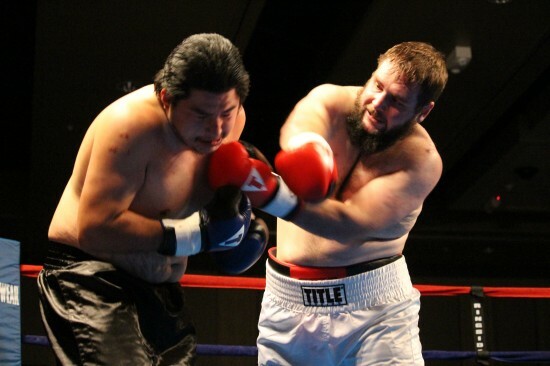 Lapwaii, Idaho’s Laramie Scott (1-0) defeated Merle SiJohn(0-1), of Worley, Idaho, with a four round unanimous decision in a heavyweight contest. SiJohn had an effective start early in the first round with jabs to the mid-section, but Scott came back late in the round and easily controlled the middle portion of the fight with the more active pace. The last round was close with Scott slowing and SiJohn working well with right hands. The final tallies all favored Scott with scores of 40-36, and 39-37 twice. In the first pro bout of the night, Hays, Montana’s Megan Martin (1-0-1) claimed her first win as a professional prize fighter, pitching a shutout over Wendy Tony (0-1) of Spokane, Washington. The bout got off to a wild start with Tony immediately pressing her way in close and unloading, forcing a closed quarters fight for the first minute of the round. Martin began to find her range mid-way through the round, though, working off her jab and following up with quick right hands. By the start of the second round she had taken control of the tempo of the fight, stepping in and out of the pocket with quick combinations. Wendy remained a game fighter throughout, but she was outworked by the busier and more accurate Martin. All three judges scored the fight 40-36 for Martin. Sean Quinnett and Jacob Ruffin put on an entertaining four round welterweight exhibition bout. Quinnett, who was originally scheduled on the pro portion of the show, had his opponent fall through days before the event. Thankfully, his stablemate Ruffin stepped in to give him four rounds of work. Both fighters displayed a solid skill-set, but it was Quinnett who had the quicker hands and landed the more effective shots. No decision was rendered in this match. In a heavyweight amateur bout, Lapwaii, Idaho’s Orlando Garcia stopped Nampa, Idaho’s Dan Alberthson after two rounds of action. Garcia was clearly the more seasoned of the two fighters, working behind a jab and finding openings for his right hand. In the second round Garcia began to dominate, landing almost at will on his opponent and drawing a heavy flow of blood from his nose. In between the second and third rounds the decision was made to stop it, giving Garcia the TKO win. In the final amateur bout, Lapwaii’s Wade Anderson scored a first round TKO win over Jose Rojas, of Carson, Washington. Rojas had a good start to the bout, but slowed down early on in the round, allowing for Anderson to take over. An overhand right dropped Rojas mid-way through the round after which the referee stopped it at 1:27 of the round. The new promotion could possibly be back for another show in February. 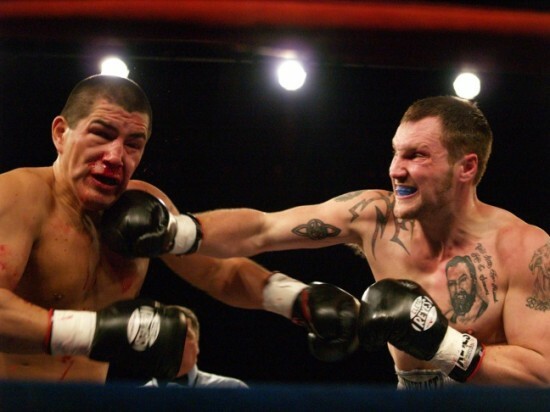 After a lengthy drought of professional boxing in the State of Idaho, the first card scheduled to take place there in nearly five years is set. The newly formed Beat Boxing Promotions will present their inaugural card at the Clearwater River Casino in Lewiston, Idaho, Saturday, October 15th with eight pro bouts scheduled featuring fighters from the Pacific Northwest.